Dave DeAndrea is an ISDN﻿﻿ Voice Actor and Producer whose credits include National Ad Campaigns (Game of War, Toyota, SENSA, Regus, AutoNation, Evinrude, Westwood College), Corporate Narrations (WalMart, Disney, HP, LPL Financial, Panasonic, Duracell, PetSmart), Animation and Video Games (Axe Cop, Hard West, Heroes of Newerth), Radio and TV Imaging (SmoothJazz.com, SBN), and everything in between. His innate ability to subtly shift the rich tone of his voice makes him sound believable and genuine no matter the style, whether it's a "Cool Dad" commercial, a sincere hospital spot, a “corporate casual” sound for a presentations, a laid back John Krasinski type, or a bit of grit for a Sam Elliot-esque read...and Dave perfectly captures the “guy next door” sound...if the guy you live next door to just happens to have an amazing voice. He has an array of animated character voices, has drawn comparisons to Liam Neeson, and he even does a Morgan Freeman impersonation that had The Ellen Show hiring him for a segment. Dave’s studio is on the beautiful Southern Oregon coast where he resides with his lovely wife, Kristen, and their family. They're actively involved in their church, Bandon Christian Fellowship, where Dave serves as an Elder, and they enjoy all the beauty that Oregon affords; hiking, fishing, and just playing at the beach. While he wouldn't call himself a "hoarder", Dave has been known to amass a few favorite collectibles, including: Disney Pixar diecast Cars, Ray Harryhausen monster figures, and anything to do with Superman. Dave’s early 80’s realization that he just wasn’t cut out to be a professional break-dancer led him to a love for being a scratch/mix DJ and spinning records instead of spinning on his head. He soon grew roots in radio and discovered a natural talent in the production room which garnered him lots of attention as the commercials he wrote, voiced, and produced were being requested by listeners more than the music the station played! From those days of splicing reel to reel tape to now editing with the click of a mouse, Dave has translated his talents into a successful, full-time, international career as a voice actor and producer. ﻿﻿Male Voice Overs by North American, neutral accent Voice Actor, Dave DeAndrea Voice Over Actor and Producer, Dave DeAndrea. 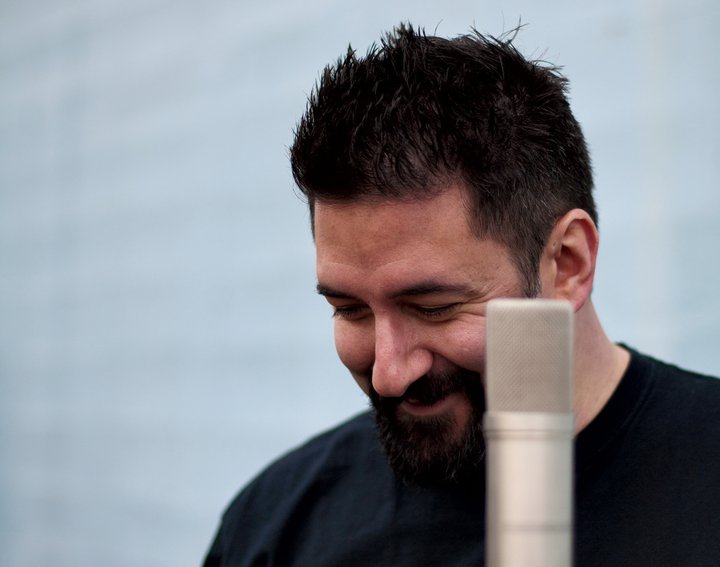 Male Voice Overs by Dave DeAndrea are anything but your average voice overs. Each session is treated with care and creativity. Your recording session and voice over is carefully crafted to offer a one of a kind unique voice over in North America and globally..
Dave DeAndrea, Male Voice Actor & Producer, offers voice overs in the Pacific Northwest, the West Coast, the United States, North America, and destinations world wide. Guy you'd sit next to at a bar, guy next door, natural, authoritative, smooth. These are the words typically used to describe this Oregon Male Voice Over Talent. He captures a similar essence to John Krasinski, Morgan Freeman, and Sam Elliott. Dave is the Cool Dad Voice. He takes pride in offering his clients the type of male voice over they are looking for. Its one thing to do voice overs, its another to create art for clients.